Geek Lit Etc. 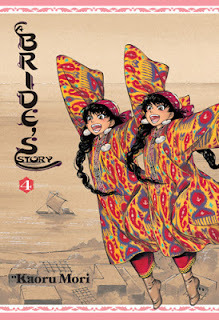 : Manga Monday: Why did Mr. Smith think he could sleep astride a camel? Manga Monday: Why did Mr. Smith think he could sleep astride a camel? Mr. Smith continues on his travels, and meets two special young ladies, in Kaoru Mori's A Bride's Story Volume 4. Note: A Bride's Story Volume 4 is, of course, the sequel to A Bride's Story Volume 3. The review of A Bride's Story Volume 1 is here, and the review of A Bride's Story Volume 3 is here. Otherwise, read on! The problems Amir and Karluk face with Amir's natal family haven't precisely resolved themselves, but it's still time for Mr. Smith to move on. So with his guide, and a camel, he continues to head towards Ankara. Along the way, outside the fishing village of Munaq, Mr. Smith has a bit of an accident and is rescued by twin girls Laila and Leily. Now that the girls are of a marriageable age, their favorite pastime seems to be hiding behind corners at the market, and trying to catch a husband. They're pretty specific in what they want, though. They want to be married to brothers, who are rich, handsome and permissive. A rather tall order. Their father, however, has different plans for them. Sarmaan and Farsami are brothers, the sons of a long-time partner and friend of their father. As both families are far from wealthy, the fathers begin to discuss perhaps pairing their children as marriage matches. Of course, neither father would want to make their children unhappy, so they suggest that they pair off and get to know each other better. Laila, Leily, Sarmaan and Farsami have known each other for as long as any of them can remember. In fact, both sets of siblings see the other pair as rather interchangeable. Will they be able to strike some sort of accord, even though none is what the other might have picked for himself? And will Laila and Leily finally learn some of the domestic arts from their mother that they should have been practicing? As usual, this volume is bookended by the overarching story of Mr. Smith's journey. He arrives in a town, and then fades into the background as we learn about the lives of the local men and women, and then he fades back in as the story needs to progress. It's an excellent, if common, plot device, and Mori never lets it seem stilted or sudden. The art, as usual, is stunning, and the new characters are just as endearing and three-dimensional as we've seen thus far. Once again, Mori has delivered an excellent volume in a lovely series. Highs: Laila and Leily's shenanigans in the market, trying to entrap a husband. Lows: I still miss Amir and Karluk, and wonder what's going on with Talas.